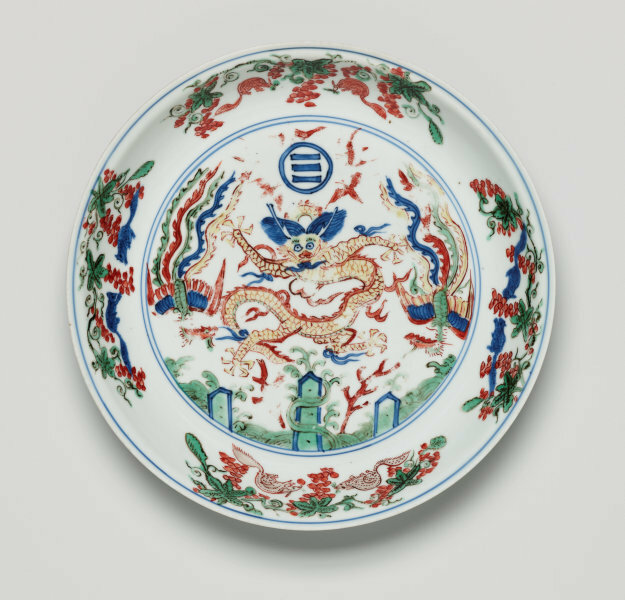 In the interior centre of this colourful dish is an ascending five-clawed dragon with its mane flying apart in the middle. Alongside the dragon are two descending phoenixes. Below them are three geometric designs arising from the wavy ocean, symbols of the sacred mountains of Penglai, Fangzhang and Yingzhou in the Bohai sea. At the top is a circle containing three bars, the first character in 'Book of Change' - Qian. Qian refers to the sky, the sun and male yang force. On the sides of the dish are animals under branches of flowering pomegranate trees whose seeds symbolise male heirs. On the exterior are ruyi (literally meaning 'as you wish') floral patterns.